Days like yesterday don't come around all the time. The wind was howling, but the sun was shining. The day was busy, but productivity was booming. I had more hairspray in my hair than usual I ever use, but it looked fantastic! I even got part of a project done; a car seat cover that I will not reveal until it is completely finished! Drew wasn't working yesterday so I took advantage of his presence by leaving him home while Mariasha (my upstairs neighbor) and I took a trip to take some pictures of the newest item in my Etsy shop... 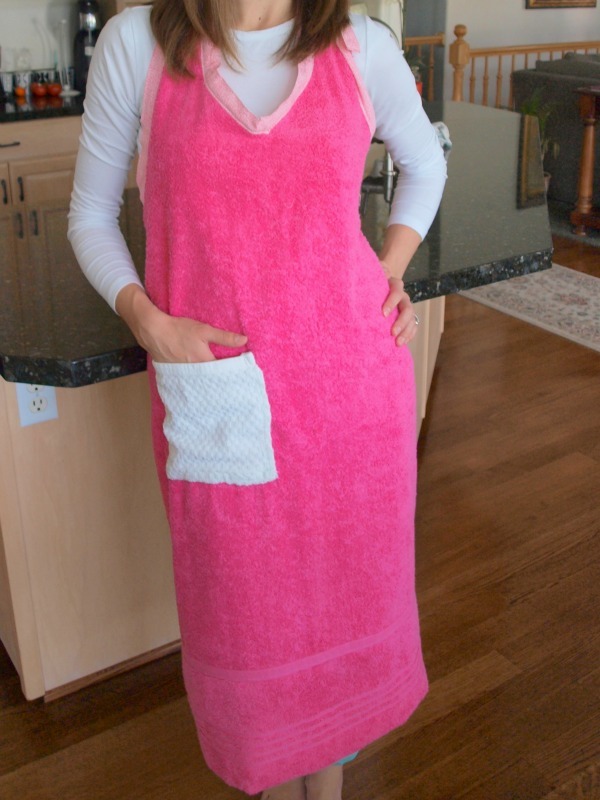 The Baby Bath Time Towel Apron! Some of you might remember my tutorial for this a couple months ago. I still maintain that it is one of the best, and most utilized item I have made (other than the Changing Mat and Car Seat Protector that are also available in my Etsy shop), but I've had a few people mention that they would love to purchase this item. I'm happy to oblige! Click on the Etsy tab at the top of this page for more information. 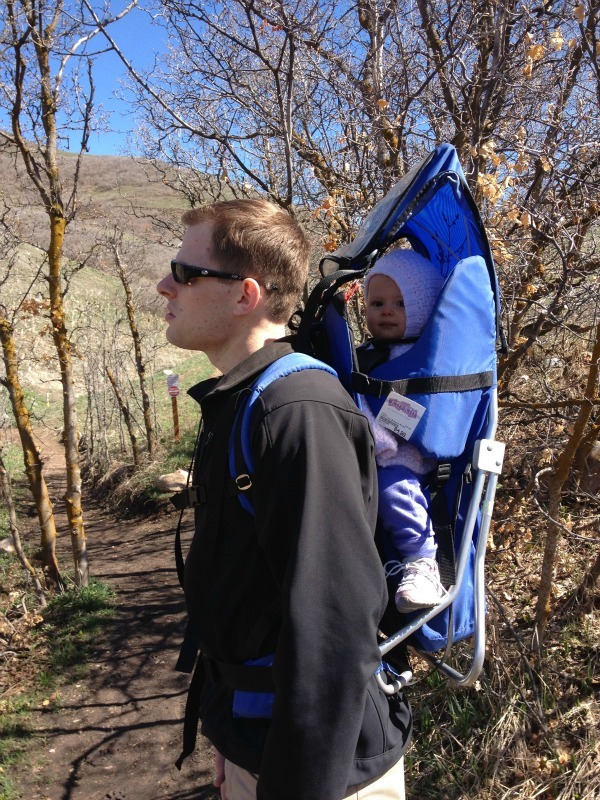 Now, with springtime coming and the sun shining, Drew and I have decided that we want to be really active this summer. So, last weekend we bought Chelsea a hiking backpack and used it for the first time yesterday! 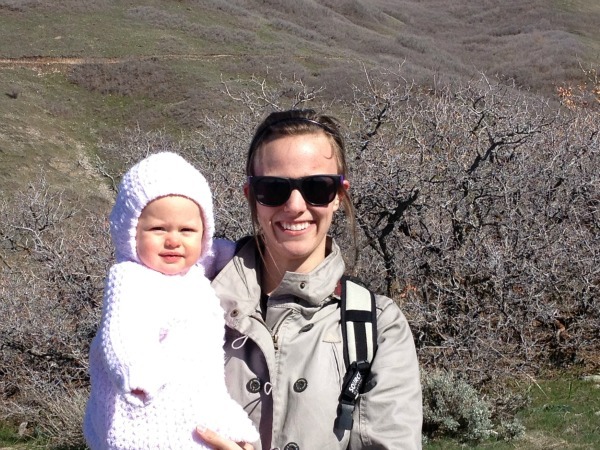 We dressed ourselves and Chelsea as warmly as we could and picked a short and easy hike for Chelsea's first. 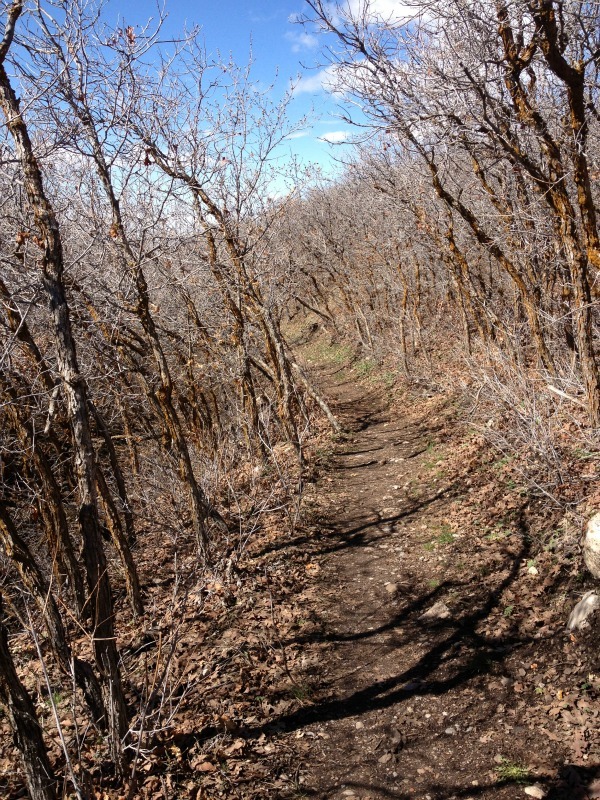 When we got out of the car at the trail head, our spirits were high, and so was the wind speed. We simply shrugged it off and got Chelsea set up in the backpack. Things started out really well. 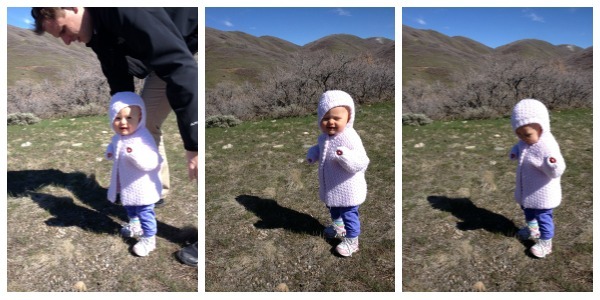 Chelsea was loving all the scenery and trying to growl like a wolf or bear. The wind wasn't even so bad because the trees acted as our protectors. But things started going downhill (and by downhill, I actually mean uphill) once we left the protection of our tall plant friends . The wind seemed to pick up and we noticed Chelsea's hands turning pretty red. So we pulled her sleeves over her hands and she didn't like that too much. 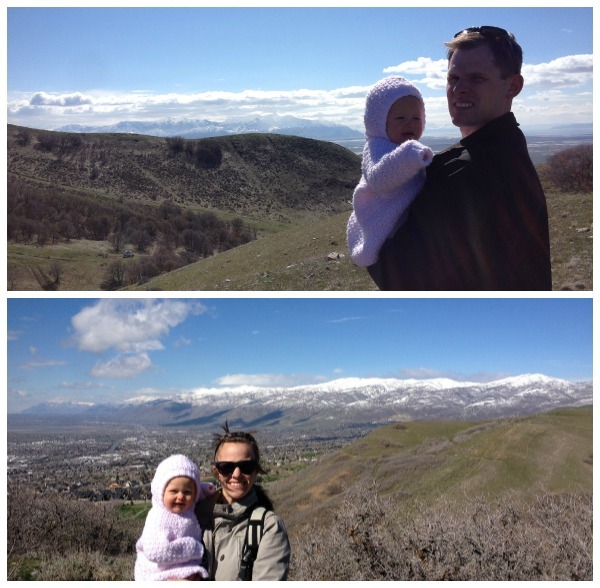 Finally, we reached a lookout spot with a view of the Davis County Valley and it was beautiful! We even got Chelsea out to enjoy it for a while. She seemed pretty happy to take some pictures and to be on her own two feet. Chelsea particularly enjoyed picking up rocks and examining them, which wouldn't have been such a big deal, but some of those rocks were actually dried-up deer poop and I happen to know that Chelsea has a habit of putting "rocks" in her mouth. When it was time to get Chelsea back in her pack, I brushed the rocks and the "other rocks" out of her hands and strapped her in. She. Was. Not. Happy. 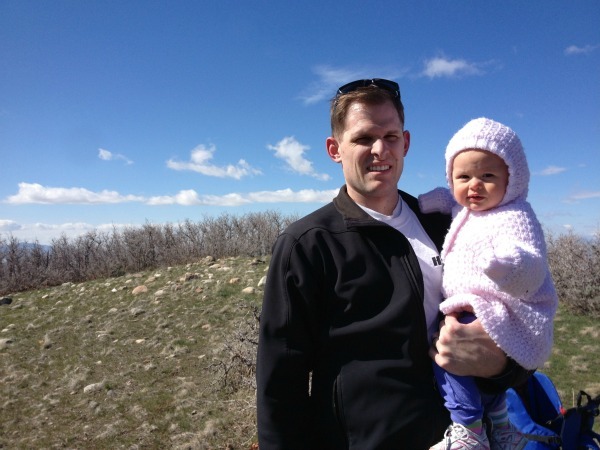 We tried to get down the trail as quickly as possible, but she was so upset, and continued crying until we were halfway down the trail. It was then we decided to get her out and just carry her the rest of the way down. Before starting again, Andrew let her walk for a minute and gave her a little rock. It was then that a miracle happened... As soon as that little, red rock was in Chelsea's little, red hand, all crying ceased. We started on our way again, and Drew tucked her little hand with the rock in my jacket. Chelsea couldn't even look at or see the rock in her hand, but she was suddenly so happy! We made it down the rest of the way and into the car, not even a whimper from dear little Chelsea until I removed the rock and substituted it with some Cheerios. If only we had known that all Chelsea wanted was a rock. Thanks for visiting! Be sure to stop by my Etsy shop before you go and I'll see you on Friday!